Sefiani is working with the Avner Pancreatic Cancer Foundation to help raise awareness of the alarming statistics for pancreatic cancer in Australia and the need for $52 million funding for research and better treatment of the disease to improve life expectancy. Sefiani produced a comprehensive report on pancreatic cancer which was launched nationally on 7 April, receiving prominent media coverage including National Nine News, Channel 10 News, and the Sunday Telegraph. On the day prior to launch, the Leader of the Opposition Bill Shorten pledged to commit $4 million to the Avner Foundation to fund the first Pancreatic Cancer Hub in Australia. 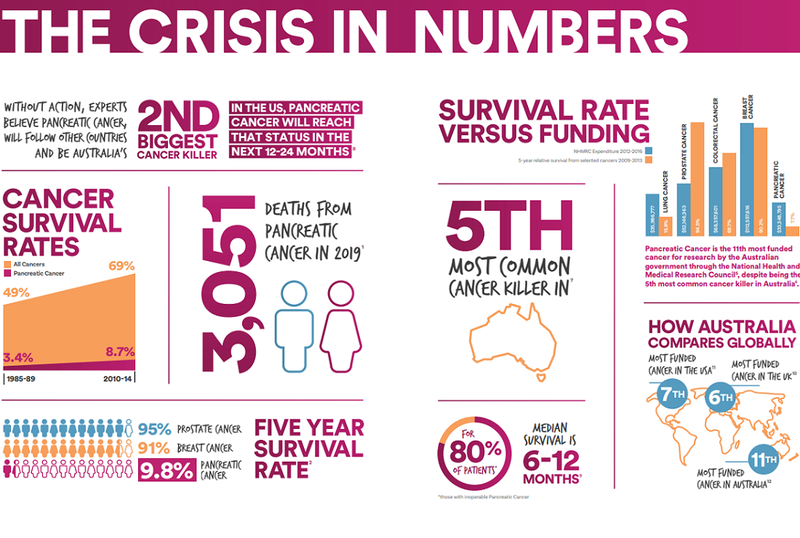 The Avner Pancreatic Cancer Foundation has launched a new report calling for urgent government action to drastically reduce its death rate and extend support to patients by increasing government funding into the disease. The survival rate of Pancreatic Cancer continues to lag behind better known, and better funded cancers, with those diagnosed with breast or prostate cancer up to nine times more likely to survive the disease, as a result of advancements in detection and treatment methods. Commenting on the report, Founder of the Avner Pancreatic Cancer Foundation, Caroline Kelly says that these staggering statistics can be tackled, but only with co-ordinated action. A key driver of the Foundation is the injustice experienced by Pancreatic Cancer sufferers and their loved ones. By developing this report, which explores the reasons behind the lack of progress, it is hoping to raise awareness of the disease and showcase how medical funding and research is the single most important factor when it comes to impacting patient survival. “Pancreatic Cancer’s stagnant survival rate won’t change until the government changes the way it distributes its funding of medical research. As it stands, the burden of disease doesn’t match the level of investment. “At the moment, there is no correlation between the impact of the disease and the level of funding directed towards researching and treating it, so we’re calling on the government to reassess this,” added Ms Kelly. In an effort to help make a difference, the Avner Foundation has developed a national strategy which will look to diminish the impact of Pancreatic Cancer over the next five years. It has developed a blueprint for action, which includes accelerating research discovery, helping today’s sufferers with the development of a support hub for patients and carers, and creating a network of high volume treatment centres, concentrating skills and resources to ensure every patient has an equal opportunity to enjoy the best outcome. Speaking of patient outcomes, Professor Ross McKinnon, Chairman, Avner Pancreatic Cancer Foundation Scientific Advisory Panel said that death rates remain high relative to other cancers given the absence of specific symptoms and resistance to even the most advanced therapies. “In the US, experts anticipate it to become the second biggest cancer killer within the next two years. Locally, without action, we believe we will follow this trend. To arrest this, we need to fast-track research to identify early detection strategies and treatment methods, and we need funding from government to be able to do this,” said Prof. McKinnon. Since the Foundation was created in 2008, it has raised over $10 million for Pancreatic Cancer, which has been invested in clinical trials, genomics and surgical research, as well as funding over 20 research grants. However, the Foundation has a greater goal in sight when it comes to improving the survival rate of Pancreatic Cancer. “We’re asking the government for $52 million over five years, so that we can further invest in key programs that will improve patient outcomes. We have an experienced Scientific Advisory Panel who have identified particular areas and programs that have the most potential to make survival possible. “Clinically, Pancreatic Cancer has been a difficult cancer to identify and treat. The organ itself is hidden; there are no obvious symptoms; there isn’t an early warning test; and while innovative treatment methods such as immunotherapy have dramatically improved the prognosis of other cancers, historically it has no impact on Pancreatic Cancer. “Therefore, to make a dent in some of these numbers we need to take a holistic and drastic approach to the condition, and in order for us to do this we need significant government support,” said Ms Kelly.